For other uses, see Panic attack (disambiguation). Someone experiencing a panic attack, being reassured by another person. Panic attacks can occur due to a number of disorders including panic disorder, social anxiety disorder, post traumatic stress disorder, drug use disorder, depression, and medical problems. They can either be triggered or occur unexpectedly. Smoking, caffeine, and psychological stress increase the risk of having a panic attack. Before diagnosis, conditions that produce similar symptoms should be ruled out, such as hyperthyroidism, hyperparathyroidism, heart disease, lung disease, and drug use. Treatment of panic attacks should be directed at the underlying cause. 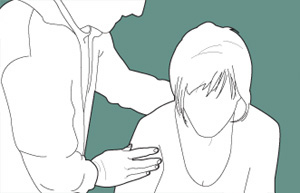 In those with frequent attacks, counselling or medications may be used. Breathing training and muscle relaxation techniques may also help. Those affected are at a higher risk of suicide. In Europe about 3% of the population has a panic attack in a given year while in the United States they affect about 11%. They are more common in females than males. They often begin during puberty or early adulthood. Children and older people are less commonly affected. Panic attacks are distinguished from other forms of anxiety by their intensity and their sudden, episodic nature. They are often experienced in conjunction with anxiety disorders and other psychological conditions, although panic attacks are not generally indicative of a mental disorder. Some maintaining causes include avoidance of panic-provoking situations or environments, anxious/negative self-talk ("what-if" thinking), mistaken beliefs ("these symptoms are harmful and/or dangerous"), and withheld feelings. A common denominator of current psychiatric approaches to panic disorder is that no real danger exists, and the person’s anxiety is inappropriate. Panic attack symptoms can be experimentally induced in the laboratory by various means. Among them, for research purposes, by administering a bolus injection of the neuropeptide cholecystokinin-tetrapeptide (CCK-4). Various animal models of panic attacks have been experimentally studied. An increase of serotonin in certain pathways of the brain seem to be correlated with reduced anxiety. More evidence that suggests serotonin plays a role in anxiety is that people who take SSRIs tend to feel a reduction of anxiety when their brain has more serotonin available to use. The main inhibitory neurotransmitter in the central nervous system (CNS) is GABA. Most of the pathways that use GABA tend to reduce anxiety immediately. Dopamine’s role in anxiety is not well understood. Some antipsychotic medications that affect dopamine production have been proven to treat anxiety. However, this may be attributed to dopamine’s tendency to increase feelings of self-efficacy and confidence, which reduce anxiety in an indirect way. Many physical symptoms of anxiety, such as rapid heart rate and hand tremors, are regulated by norepinephrine. Drugs that counteract norepinephrine’s effect may be effective in reducing physical symptoms of a panic attack. Because glutamate is the primary excitatory neurotransmitter involved in the central nervous system (CNS), it can be found in almost every neural pathway in the body. Glutamate is likely involved in conditioning, which is the process by which certain fears are formed, and extinction, which is the elimination of those fears. People who have been diagnosed with panic disorder have approximately double the risk of coronary heart disease. Certain stress responses to depression also have been shown to increase the risk and those diagnosed with both depression and panic disorder are nearly three times more at risk. In DSM-5, culture-specific symptoms (e.g., tinnitus, neck soreness, headache, and uncontrollable screaming or crying) may be seen. Such symptoms should not count as one of the four required symptoms. Some or all of these symptoms can be found in the presence of a pheochromocytoma. Screening tools such as the Panic Disorder Severity Scale can be used to detect possible cases of disorder and suggest the need for a formal diagnostic assessment. A 2009 review found positive result from therapy and medication and a much better result when the two were combined. Caffeine may cause or exacerbate panic anxiety. Anxiety can temporarily increase during withdrawal from caffeine and various other drugs. Increased and regimented aerobic exercise such as running have been shown to have a positive effect in combating panic anxiety. There is evidence that suggests that this effect is correlated to the release of exercise-induced endorphins and the subsequent reduction of the stress hormone cortisol. Muscle relaxation techniques are useful to some individuals. These can be learned using recordings, videos, or books. While muscle relaxation has proved to be less effective than cognitive behavioral therapies in controlled trials, many people still find at least temporary relief from muscle relaxation. In the great majority of cases hyperventilation is involved, exacerbating the effects of the panic attack. Breathing retraining exercise helps to rebalance the oxygen and CO2 levels in the blood. Capnometry, which provides exhaled CO2 levels, may help guide breathing. The efficacy of group therapy treatment over conventional individual therapy for people with panic disorder with or without agoraphobia appear similar. Roughly one-third are treatment-resistant. These people continue to have panic attacks and various other panic disorder symptoms after receiving treatment. Many people being treated for panic attacks begin to experience limited symptom attacks. These panic attacks are less comprehensive, with fewer than four bodily symptoms being experienced. ^ a b "Anxiety Disorders". NIMH. March 2016. Archived from the original on 29 September 2016. Retrieved 1 October 2016. ^ a b Bandelow, Borwin; Domschke, Katharina; Baldwin, David (2013). Panic Disorder and Agoraphobia. OUP Oxford. p. Chapter 1. ISBN 9780191004261. Archived from the original on 20 December 2016. ^ a b Craske, MG; Stein, MB (24 June 2016). "Anxiety". Lancet. 388 (10063): 3048–3059. doi:10.1016/S0140-6736(16)30381-6. PMID 27349358. ^ a b "Panic Disorder: When Fear Overwhelms". NIMH. 2013. Archived from the original on 4 October 2016. Retrieved 1 October 2016. ^ a b c Geddes, John; Price, Jonathan; McKnight, Rebecca (2012). Psychiatry. OUP Oxford. p. 298. ISBN 9780199233960. Archived from the original on 4 October 2016. ^ Ghadri, Jelena-Rima; et al. (June 7, 2018). "International Expert Consensus Document on Takotsubo Syndrome (Part I): Clinical Characteristics, Diagnostic Criteria, and Pathophysiology". European Heart Journal. 39 (22): 2032–2046. doi:10.1093/eurheartj/ehy076. ^ Roth, WT (2010). "Diversity of effective treatments of panic attacks: what do they have in common?". Depression and Anxiety. 27 (1): 5–11. doi:10.1002/da.20601. PMID 20049938. ^ Klerman, Gerald L.; Hirschfeld, Robert M. A.; Weissman, Myrna M. (1993). Panic Anxiety and Its Treatments: Report of the World Psychiatric Association Presidential Educational Program Task Force. American Psychiatric Association. p. 44. ISBN 978-0-88048-684-2. ^ Cosci, Fiammetta. "The psychological development of panic disorder: implications for neurobiology and treatment". SciELO. Revista Brasileira de Psiquiatria. Retrieved 11 March 2018. ^ Nolen-Hoeksema, Susan (2013). (Ab)normal Psychology (6th ed.). McGraw Hill. ISBN 9780078035388. ^ a b c d Taylor, Barr (2006). "Panic disorder". BMJ. 332 (7547): 951–955. doi:10.1136/bmj.332.7547.951. PMC 1444835. PMID 16627512. ^ Gorman, JM; Kent, JM; Sullivan, GM; Coplan, JD (April 2000). "Neuroanatomical hypothesis of panic disorder, revised". The American Journal of Psychiatry. 157 (4): 493–505. doi:10.1176/appi.ajp.157.4.493. PMID 10739407. ^ The Cochrane Library: Cochrane Database of Systematic Reviews. 1996. doi:10.1002/14651858. ^ "Agoraphobia". MayoClinic.com. 21 April 2011. Archived from the original on 24 June 2012. Retrieved 2012-06-15. ^ Moreira, Fabrício A.; Gobira, Pedro H.; Viana, Thércia G.; Vicente, Maria A.; Zangrossi, Hélio; Graeff, Frederico G. (2013). "Modeling panic disorder in rodents". Cell and Tissue Research. 354 (1): 119–25. doi:10.1007/s00441-013-1610-1. PMID 23584609. ^ a b c d e Bystritsky, Alexander (2013). "Current Diagnosis and Treatment of Anxiety Disorders". P & T : A Peer-Reviewed Journal for Formulary Management. 38 (1): 30–57. PMC 3628173. PMID 23599668. ^ Vollmer, L. L.; Strawn, J. R.; Sah, R. (2015-05-26). "Acid–base dysregulation and chemosensory mechanisms in panic disorder: a translational update". Translational Psychiatry. 5 (5): e572. doi:10.1038/tp.2015.67. PMC 4471296. PMID 26080089. ^ Ueda, Yoshiyasu; Aizawa, Masayo; Takahashi, Atsushi; Fujii, Masamitsu; Isaka, Yoshitaka (2009-03-01). "Exaggerated compensatory response to acute respiratory alkalosis in panic disorder is induced by increased lactic acid production". Nephrology Dialysis Transplantation. 24 (3): 825–828. doi:10.1093/ndt/gfn585. ISSN 0931-0509. PMID 18940883. ^ Tavel, ME (28 July 2016). "Panic Attacks: Concealed Hyperventilation Usually Overlooked" (PDF). JSciMedCentral. Retrieved 4 October 2017. ^ Cipolla, Marilyn J. (2009). Control of Cerebral Blood Flow. Morgan & Claypool Life Sciences. ^ Nardi, Antonio Egidio; Freire, Rafael Christophe R. (2016-05-25). Panic Disorder: Neurobiological and Treatment Aspects. Springer. ISBN 9783319125381. ^ Shin, Lisa M; Liberzon, Israel (January 2010). "The Neurocircuitry of Fear, Stress, and Anxiety Disorders". Neuropsychopharmacology. 35 (1): 169–191. doi:10.1038/npp.2009.83. ISSN 0893-133X. PMC 3055419. PMID 19625997. ^ Maren, Stephen (2009-11-25). "An Acid-Sensing Channel Sows Fear and Panic". Cell. 139 (5): 867–869. doi:10.1016/j.cell.2009.11.008. ISSN 0092-8674. PMID 19945375. ^ PhD, Andrew M. Leeds (2016-02-03). A Guide to the Standard EMDR Therapy Protocols for Clinicians, Supervisors, and Consultants, Second Edition. Springer Publishing Company. ISBN 9780826131171. ^ a b Chalmers, John A.; Quintana, Daniel S.; Abbott, Maree J.-Anne; Kemp, Andrew H. (2014). "Anxiety Disorders are Associated with Reduced Heart Rate Variability: A Meta-Analysis". Frontiers in Psychiatry. 5. doi:10.3389/fpsyt.2014.00080. ISSN 1664-0640. ^ a b Soares-Filho, Gastão L. F.; Arias-Carrión, Oscar; Santulli, Gaetano; Silva, Adriana C.; Machado, Sergio; Valenca, Alexandre M.; Nardi, Antonio E. (2014). "Chest pain, panic disorder and coronary artery disease: a systematic review". CNS & Neurological Disorders Drug Targets. 13 (6): 992–1001. ISSN 1996-3181. PMID 24923348. ^ Houck, P. R.; Spiegel, D. A.; Shear, M. K.; Rucci, P. (2002). "Reliability of the self-report version of the Panic Disorder Severity Scale". Depression and Anxiety. 15 (4): 183–185. doi:10.1002/da.10049. PMID 12112724. ^ Shear, M. K.; Rucci, P.; Williams, J.; Frank, E.; Grochocinski, V.; Vander Bilt, J.; Houck, P.; Wang, T. (2001). "Reliability and validity of the Panic Disorder Severity Scale: Replication and extension". Journal of Psychiatric Research. 35 (5): 293–296. doi:10.1016/S0022-3956(01)00028-0. PMID 11591432. ^ Milrod, B.; Leon, A. C.; et al. (2007). "A randomized controlled clinical trial of psychoanalytic psychotherapy for panic disorder". American Journal of Psychiatry. 164 (2): 265–272. doi:10.1176/ajp.2007.164.2.265. PMID 17267789. ^ Bandelow, Borwin; Seidler-Brandler, Ulrich; Becker, Andreas; Wedekind, Dirk; Ruther, Eckart (July 2009). "Meta-analysis of randomized controlled comparisons of psychopharmacological and psychological treatments for anxiety disorders". The World Journal of Biological Psychiatry. 8 (3): 175–187. doi:10.1080/15622970601110273. ^ American Psychiatric Association. (2000). Diagnostic and statistical manual of mental disorders (4th ed., text rev., p. 479). Washington, D.C.: American Psychiatric Association. ^ "Hyperventilation Syndrome]". 28 November 2016. Archived from the original on 13 July 2017. Retrieved 2017-09-18. ^ Craske, Michelle (30 September 2011). "Psychotherapy for panic disorder". ^ Meuret, AE; Ritz, T (October 2010). "Hyperventilation in panic disorder and asthma: empirical evidence and clinical strategies". International Journal of Psychophysiology : Official Journal of the International Organization of Psychophysiology. 78 (1): 68–79. doi:10.1016/j.ijpsycho.2010.05.006. PMC 2937087. PMID 20685222. ^ Abramowitz, Jonathan S.; Deacon, Brett J.; Whiteside, Stephen P. H. (17 December 2012). Exposure Therapy for Anxiety: Principles and Practice. Guilford Press. ISBN 9781462509690. Archived from the original on 20 May 2016. ^ Waska, Robert (2010). Treating Severe Depressive and Persecutory Anxiety States: To Transform the Unbearable. Karnac Books. ISBN 978-1855757202. ^ Kabat-Zinn J, Massion AO, Kristeller J, et al. (7 July 1992). "Effectiveness of a meditation-based stress reduction program in the treatment of anxiety disorders]". American Journal of Psychiatry. 149 (7): 936–43. CiteSeerX 10.1.1.474.4968. doi:10.1176/ajp.149.7.936. PMID 1609875. ^ a b Fava, G. A.; Rafanelli, C.; Grandi, S.; Conti, S.; Ruini, C.; Mangelli, L.; Belluardo, P. (July 2001). "Long-term outcome of panic disorder with agoraphobia treated by exposure". Psychological Medicine. 31 (5): 891–898. doi:10.1017/s0033291701003592. ISSN 1469-8978. ^ Schwartze, Dominique; Barkowski, Sarah; Strauss, Bernhard; Burlingame, Gary M.; Barth, Jürgen; Rosendahl, Jenny (2017). "Efficacy of group psychotherapy for panic disorder: Meta-analysis of randomized, controlled trials". Group Dynamics: Theory, Research, and Practice. 21 (2): 77–93. doi:10.1037/gdn0000064. ^ Neeltje, Batelaan. "Evidence-based pharmacotherapy of panic disorder: an update". Oxford University Press. International Journal of Neuropsychopharmacology. Retrieved 11 March 2018. ^ Bakker, A.; Van Balkom, A. J. L. M.; Spinhoven, P. (September 1, 2002). "SSRIs vs. TCAs in the treatment of panic disorder: a meta-analysis". Acta Psychiatrica Scandinavica. 106 (3): 163–167. doi:10.1034/j.1600-0447.2002.02255.x. ISSN 1600-0447. ^ a b Marchesi, Carlo (2008). "Pharmacological management of panic disorder". Neuropsychiatric Disease and Treatment. 4 (1): 93–106. PMC 2515914. PMID 2515914. ^ a b Freire, Rafael C.; Zugliani, Morena M.; Garcia, Rafael F.; Nardi, Antonio E. (2016). "Treatment-resistant panic disorder: a systematic review". Expert Opinion on Pharmacotherapy. 17 (2): 159–168. doi:10.1517/14656566.2016.1109628. ISSN 1744-7666. PMID 26635099. ^ a b Hettema, John M.; Neale, Michael C.; Kendler, Kenneth S. (2001-10-01). "A Review and Meta-Analysis of the Genetic Epidemiology of Anxiety Disorders". American Journal of Psychiatry. 158 (10): 1568–1578. doi:10.1176/appi.ajp.158.10.1568. PMID 11578982.